There once lived a group of monkeys in a jungle. 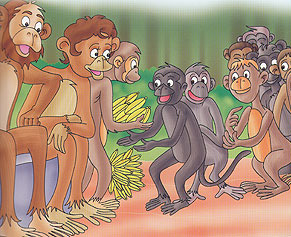 An old monkey was the chief of the group and he ruled them wisely and well. One day, the chief's wife had a wish, "Husband, I think we should all go on a fast." "Why?" he asked. "For the well-being of all the monkeys," she replied. Although the chief was not very enthused, he agreed. He called all the monkeys together to make the announcement. "My friends, today we shall all fast for the well-being of everyone. So, no one will eat a bite of food today!" All the monkeys readily agreed. "Whatever you say, chief!" they chorused. The chief thought for a moment. "When we break our fast, we will all be ravenous. So, I suggest we find food and keep it ready to eat when the fast is over." The monkeys thought this was an excellent idea. Several of them set off to find food. They climbed trees and explored until they came upon a banana tree. Chattering excitedly, they plucked many delicious yellow bananas and returned home. "Good work! Now we will have enough food to break our fast with," said the pleased chief. All the bananas were placed under a tree. "Shall we all prey before we begin our fast?” suggested a monkey. They all sat around silently, praying. A thought struck the chief's wife. "When we break the fast, we will all be so hungry that we will all pounce on the bananas together. Perhaps, we should distribute each one's share beforehand to save time later.” The Chief thought this was a brilliant suggestion. He appointed a monkey to distribute the bananas equally among all the monkeys. Each monkey came up to the pile and collected his or her share of the bananas. Then each of them sat down in his or her place, waiting for evening. They chanted prayers for a while. Slowly, the sight of the juicy bananas got too much for some of the young ones. Finally, one youngster stood up. "Sir, why don't we keep one banana ready to eat? Then we can save some more time," he suggested. The chief was pleased with the idea. "What a lovely idea! Our group is filled with intelligent monkeys! Everyone peel a banana and keep it ready!" So, all the monkeys peeled one banana and kept it ready in their hands. By now the temptation of a peeled banana in their hands was too much to bear. One by one the monkeys started getting impatient. But no one dared to disobey the chief. The chief himself was getting impatient and hungry. "This fast was not such a great idea. Why did I listen to my wife? When will evening come?" he mused. Suddenly, a baby monkey said to his father, "Father, can I keep the banana in my mouth? I promise not to eat!" The father was not sure. He asked the chief. "He won't eat it," he promised. The chief thought this was a good idea for everyone. "Albright! Everyone can place the banana in his or her mouth. This way the moment the fast is over, we can chew it and swallow it. But under no circumstances should you eat it! He instructed. "As long as we don't eat it, it's fine," agreed the baby monkey's father. One by one the monkeys put bananas in their mouths. They looked at each other comfortably as they continued the fast. Before they knew it, they were biting into the delicious bananas! And shortly afterwards all the bananas had disappeared down their stomachs! So much for a day of fasting! But on the brighter side, the monkeys definitely looked happy and satisfied!